A dispute between an Alaska boater and the National Park Service will be heard by the highest court in the country this week on Wednesday, Jan. 20. Lower courts have rejected Anchorage resident John Sturgeon’s suit challenging Park Service authority to regulate Alaska rivers, where they pass through federal conservation units. John Sturgeon’s journey to the Supreme Court started during a September 2007 trip in the Yukon-Charley Rivers National Preserve, where he says he’s long hunted moose. Sturgeon recounts being stopped on the banks of the Nation River in the preserve, making repairs to a small hovercraft, when rangers showed up and informed him hovercrafts were illegal to operate in federal parks and preserves. Sturgeon challenged the hovercraft ban, contending that Alaska’s navigable waters are state-owned and do not fall under federal jurisdiction. 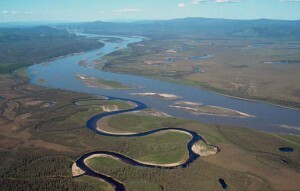 Sturgeon describes his argument, which is backed by the state of Alaska, as about government overreach and violation of the 1980 Alaska National Interest Lands Conservation Act, or ANILCA, that created numerous Alaska parks and preserves. Legally, the case boils down to a single section of ANILCA, 103-C. It says nonfederal land within a conservation unit isn’t subject to rules meant solely for the surrounding federal lands. To Sturgeon, it’s straightforward: State property is exempt from Park Service rules, but the lower courts read it to mean that state land is exempt only from Alaska-specific Park rules. The Ninth Circuit Court of Appeals concluded the hovercraft ban applies, because it’s a nationwide rule, not crafted just for an Alaska park. The broader issue of who controls river waters is also complicated. Katie Strong is an attorney with Trustees for Alaska, which is representing numerous conservation groups as friends of the court in the Sturgeon case. ANILCA specifics aside, Strong underlines that the case is about more than one person’s hunting tradition. Sturgeon agrees that the case isn’t just about him, but holds firm on Alaskans’ right to freely ply state waterways even where they traverse federal parks and preserves.